Sri Lanka, Southern Asia’s tropical island nation, is acclaimed as one of the top tourist destinations of the world. Visitors to this island are mesmerised by its beauty, history, and culture. Among the memorable experiences encountered here is the lingering taste of its exquisite natural drink – the King Coconut water. 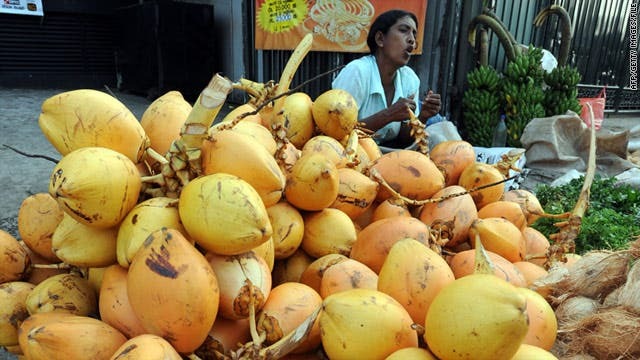 The King Coconut water is the favorite beverage of the Sri Lankans, which is becoming increasingly popular with the tourists. The King Coconuts, locally called ‘Thambili’ are a bright-orange colored variety of coconuts which are indigenous to Sri Lanka. 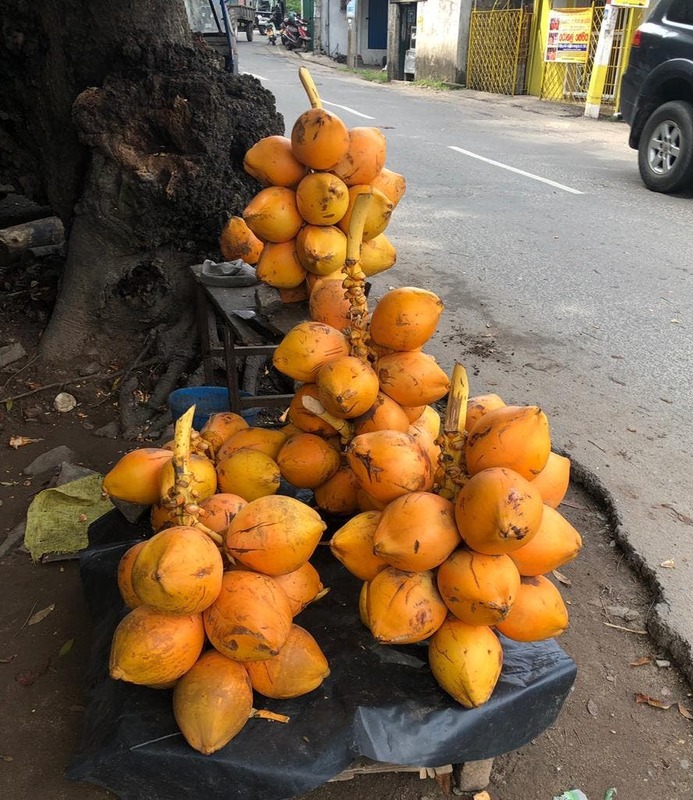 These are extensively found throughout the country especially on the beaches and roadside kiosks which are in plenty during the dry, hot summer months. Sri Lanka is increasingly becoming a preferred getaway while food and drinks in Sri Lanka are also yet another attraction that draws tourists from outside the country. And the King Coconut is the prime favorite. Tourists make it a point to stop at King Coconut roadside vendors and relish the drink. Kobatte Jeelani, a Bahrain resident who recently visited Sri Lanka, King Coconut was a real winner. He feasted on it whenever he sighted the king coconut stall. “We get this in India as well and called Kandhali. It is a really sweet drink,” he said. 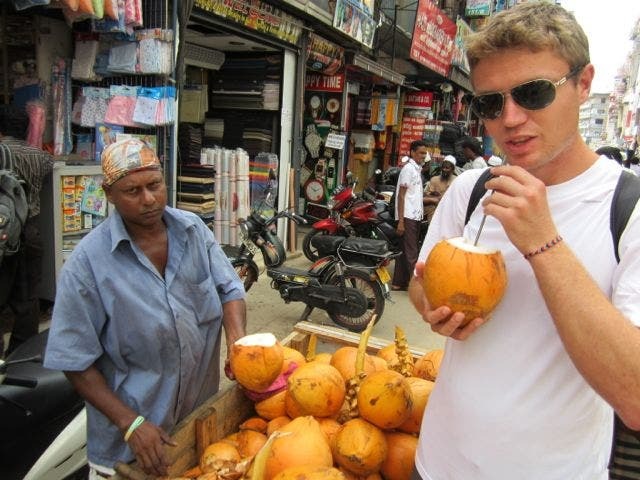 The star hotels and resorts in Sri Lanka offer King Coconut drink upon arrival at their properties as a welcome drink. The King Coconut trees are abundantly grown freely throughout the coastal belt of Sri Lanka with little or no human intervention and also are a common sight in most Sri Lankans’ homes. 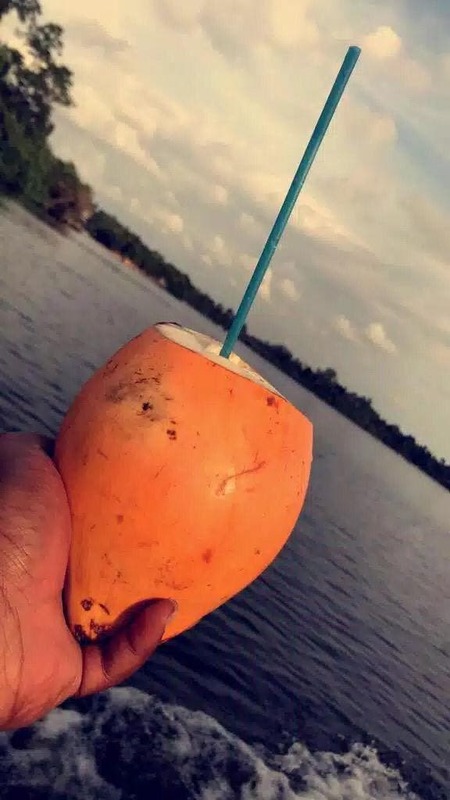 The King Coconuts are exclusively used as beverages while the common green coconuts have multiple uses. And although the young green coconut water is also consumed; the preferred choice of many Sri Lankans is the King Coconut water. The King Coconut has several sub-varieties in Sri Lanka; the commonest being the ‘kaha or gonthambili’ and ‘ran thambili’. The King Coconut water is the favorite drink of the locals and its drinking has been a centuries-old tradition in Sri Lanka, being widely prized for its nutritive and curative properties and extensively used in Ayurvedic therapy since millennia. The main constituents of the King Coconut water are easily digestible sugars, minerals, and vitamins. The minerals are the potassium and sodium, the ‘serum electrolytes’ of which potassium is found in much higher concentration than sodium. The King coconut water also contains other key minerals such as calcium, iron, zinc, magnesium, manganese, and phosphorus. It also contains vitamin C and some vitamins of the B-complex group such as thiamine, riboflavin, niacin, biotin, pyridoxine and folate. · As it is rich in serum electrolytes, it is used as a rehydrant fluid and energy booster especially after physical activities. · The vitamins in the King Coconut water are required as coenzymes essential for cellular functions. · Cytokinins in the King Coconut water are believed to reduce the risk of degenerative and age-related diseases and also helps to fight against cancer. · The minerals in this water helps to regulate the blood pressure levels and also promote general wellness of our being. · As King Coconut water contains higher dietary soluble fiber and naturally occurring bioactive enzymes; it aids in digestion and improves constipation. It is useful in treating diarrhea and cholera and other gastrointestinal diseases. · King Coconut water acts as a diuretic and flushes out toxins and drugs from the body. It is also effective in the treatment of bladder infections as well as kidney and urethral stones. · As it is isotonic with human blood, it had been used during World War II for emergency plasma transfusion; being a natural substitute for saline solution. · Since the King Coconut water contains more sugar, it is tastier and sweeter when compared to water of other varieties of coconuts although it’s sugar content is much lesser than other aerated drinks and processed fruit juices. Thus, the King Coconut water brimming with nutrition and vitality is considered to be a ‘pharmaceutical wonder’ or a ‘living pharmacy’ by Sri Lankans. And in recent years, Sri Lanka has been packing this ‘fluid of life’ into tetra packs and bottles and widely exporting to other countries wherein consumers have adopted the coconut water as ‘Mother Nature’s Sports Drink’. The craze and virtues of coconut water appeals the health-conscious people who are increasingly preferring it over the fizzy drinks and packed juices; the King Coconut water is surely making waves further from its native Sri Lanka.